I’ve had “feed and trim roses” on my to-do list for too long. Finally, with temperatures hovering in the livable range, I went out to begin the task of rescuing my roses from a tangling web of spindly canes and the long-limbed crabgrass that spread across the mulch. I didn’t do anything with them through July and they need one more good feeding before August dissolves. Trying to understand where to begin any big task usually pushes me into a state of overwhelm, so I just begin and see where it takes me. I did remember to wear a long-sleeved shirt and gloves to protect my arms from thorns and gathered tools and a bag for refuse. The roses sit along the north fence line. It’s a perfect place in the early spring because sunshine hits it early and long. But by summer, with an overhead sun, the trees on the other side of the fence are beginning to stretch south across that same fence and fill up with vines, a yearly annoyance. The vines like to crawl up under the fence or over the fence or anywhere to get to the roses. I began with the vines. And then the wild violets which I like everywhere but in my rose beds. By the time I’d cleared over and around each bush, I was ready to begin trimming by selecting a couple of strong canes and clipping away the rest. A young male cardinal came to sit on one of the branches above me and chittered. “What?” I asked. Food? I refilled the bird feeder and put fresh water in the bird bath. That seemed to be the meaning of his command. The best thing about working outside is not thinking. I just work. And my mind, allowed freedom, wanders with me. We’ve had finches in the yard this year. Lately, I’ve seen hummingbirds in the morning, so I’ve put out a clean feeder with sugar-water. We’ve also been visited by two pair of goldfinches, busy at the cone flower heads and bulking up for migration. This afternoon, I saw two swallowtail butterflies, hovering over the pinks. I guess we’re all getting ready for fall. Yesterday, I cleared off my desk of accumulated bits and pieces of paper – classes and routine begin next week. 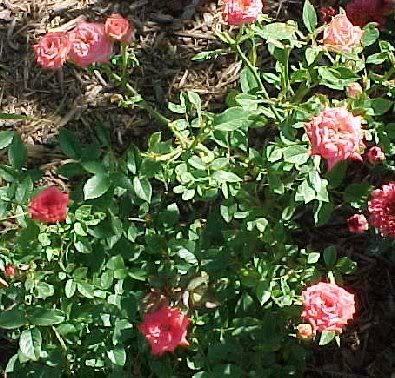 As I left the strongest canes and pruned away the spindly ones, I thought about how life is like growing roses. And perhaps the reason they’ve been so popular for so many years. I can grow a lot of spindly starts and shoots – and especially in the summertime when my routine is less defined. I have bits and pieces of writing, bits and pieces of ideas, bits and pieces of quotes from books. None of them will bloom if I don’t pare down and save what’s strongest – the spindly pieces lined with thorns will only get in the way. Of course, roses have also been associated with a spiritual life for centuries: unparalleled beauty surrounded by thorns as if in order to earn the treasure, you must first be tested and found worthy. What makes a spiritual life “worthy” of the time it takes to prune away anger, discord, judgment, self-hate? Why spend a lifetime, a human lifetime that blooms and fades so quickly, struggling with such determined thorns? The only answer I can give is my own: because I am more content. In this in-between time, between the fullness of summer and the fading of autumn, take some time to prune away what you no longer need. Find the canes in you that are strong and feed your roses, whether literal or metaphorical, and allow your spirit to bloom. there is something about dirt on your hands and the smell that is cleansing and somehow better than what you were doing before. diana has put several roses in our yard each with it’s own personality. my favorite has only about 4 canes and is about 5 feet high. it blooms in the spring and fall. maybe 5 little yellow buds. the whole plant looks like it could just blow away. the fall buds will last for an unusually long time. it’s heartening to see this weak little flower covered in snow with no thought of fading. How interesting that tending to actual, painful thorns can help disempower mental thorns. I’m not going to garden this weekend but will instead work on house cleaning. I’ll apply some of this intentional “now-ness” in my chores. Once again I find myself loping alongside your path, Janet, on my own meandering journey. In celebration of the relief from the heat, I too, donned long pants and straw hat to weed flower beds. I realized I must have gotten a wee bit too enthused when my iPod workout music was playing for the second time around! As I weed, I like to open my consciousness to any lurking critical thoughts or negative concerns that seem to weave themselves into a tangled undergrowth in my words and actions. There is something so satisfying in stuffing all those weeds into the burn-pile for later in the fall; angry words going up in smoke. And I always feel a weary but exhilarated glow after a good, sudsy shower on those aching muscles and green-stained bare feet!